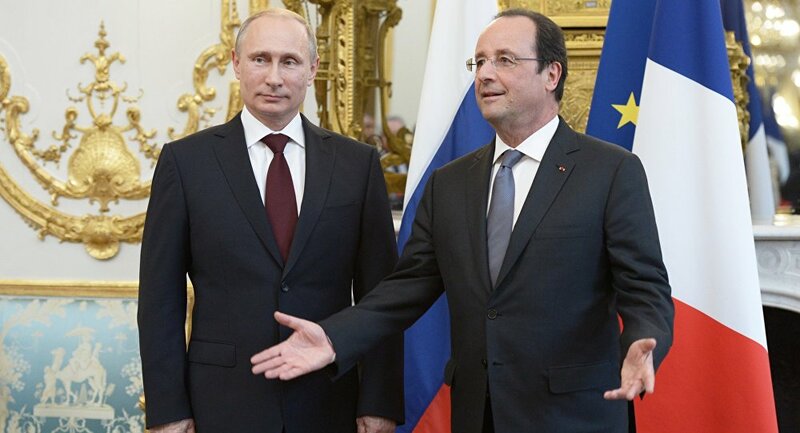 Following a meeting with Vladimir Putin, Francois Hollande has proved himself to be an independent leader, who is willing to disregard US interests, defense expert Konstantin Sivkov told Sputnik. "For the first time in a long time a politician controlled by the US made a stand against … American geopolitics," Sivkov noted. "Hollande is acting tough and disregarding US interests in the process. By promoting ties with Russia, the French president is 'creating cracks in NATO's spirit,' essentially splitting the US-led coalition. This deals American geopolitics a major blow." The analyst believes that the meeting could lead to real military and technological cooperation between Russian and Western forces engaged in the fight against ISIL. The two leaders met in Moscow on Thursday to discuss anti-ISIL efforts and agreed to share intelligence data on terrorist groups. International relations expert Dmitry Suslov described the agreement as a "colossal breakthrough and colossal success." "We managed to reach an agreement with Hollande in those areas, where we failed to with Obama," the analyst noted at a round table discussion held by Rossiya Segodnya International Information Agency. Russia could use this opportunity to encourage cooperation with the US-led coalition via the communication channel between Moscow and Paris, he noted. Hollande's visit to Moscow, according to Suslov, has also put an end to attempts to "consolidate the US-led coalition against Russia and to exclude any contacts between Russia and the Western coalition on activities in Syria." Other experts do not share this optimism. International relations analyst Sergei Bolshakov considers Hollande to be a "week leader, who is fully controlled by the US." In his opinion, Washington is not interested in changing its strategy in the Middle East. Russia has been engaged in counterterrorism efforts in Syria following a request from Damascus since September 30. Moscow's aerial campaign is aimed at destroying radical groups, which are seeking to overthrow the government of Bashar al-Assad. The US-led coalition, which has not received a formal authorization from Damascus, launched an airstrike campaign tasked with degrading and destroying ISIL in September 2014.